Use this sample award letter as a guide for award letters that you write in your organization. You can send an award letter via email, but the recognition is more special if sent on company stationery and signed by the appropriate upper-level manager. Here are additional tips for writing an award letter. Following the tips, you will find a sample award letter. The award letter recognizes an employee for making a positive contribution to a workplace success or progress at work through areas such as productivity or quality gains. The award letter needs to specifically detail why the employee is receiving the recognition and the impact that the employee's contribution had on the company, the department or the customer service success. The letter should thank the employee and detail any gift, monetary award, or certificate that the employee is receiving as a result of receiving the award. It should describe any function or ceremony that will be held to honor the awardees and provide attendance details for the event. Finally, the award letter should be signed by the employee's manager, at least, or by the company's president or CEO. If you go to the trouble of providing awards, recognize them for the big deal that they are for your employee recipients. Your recipients will truly appreciate the recognition when you treat it as important. 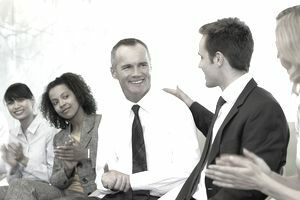 The senior management participation in the writing of the award letter or the presentation of the letter heightens the power of the recognition to the employee. The majority of employees seek recognition from the higher-ups in their organization. It tells them that the senior managers know that they exist and serve. Make awards, recognition, and gratitude a regular occurrence in your workplace to recognize and retain your best employees. The following sample letter provides an example of an approach to reward, recognition, and saying thank you. Why not take a look? You can use this award letter sample as a model. Download the template (compatible with Google Docs and Word Online), or read the text version below. Congratulations on receiving the March award for best Team Work Champion. As you know, this is an award that is provided by coworkers to the team member whom they believe contributed the most to their success during the month. Various nominations said that you went out of your way to help other employees with their parts of the project. Several co-workers said that you were unfailingly cheerful, upbeat, and positive even when the team struggled with delivery dates. Additionally, team members said that you were organized, efficient and that you worked hard on the right things. They were impressed with the amount you accomplished in a day. Team members especially appreciated the leadership role that you assumed when the team struggled with direction and the allocation of resources. All in all, you received the majority of the nominations from your fellow employees. So, it gives me great pleasure to notify you that you have been selected as Team Work Champion. The award recipient receives a $100 gift certificate to your local grocery superstore. Please let us know your store of choice. You will receive your award at the October Company Meeting so that the rest of the staff has the opportunity to recognize you and thank you for your hard work and consistent effort. Please let me know your store of choice. This letter brings you my warmest congratulations, too. It is an honor to be selected for this award by teammates. It speaks highly of how well you and your work are perceived in the company. It is a positive contribution that deserves our recognition. I am proud to say that you are a valued member of our department. Please let me know if you have questions or need additional information. Once again, warm congratulations. Need more samples for your own use in writing award and recognition letters? Here are more samples. that provide guidance as you write your own human resources letters.